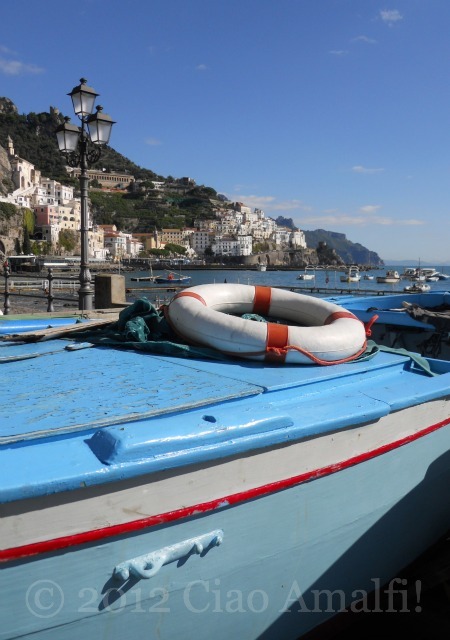 Happy Thanksgiving from the Amalfi Coast! On this Thanksgiving Day we woke up to find a beautiful sunny morning after nearly a week of overcast, windy and rainy weather. What a way to start the day, with a lovely reminder of how much there is to be grateful for each and every morning! For all of my family and friends celebrating in America and around the world, may this be a beautiful, peaceful and very happy Thanksgiving! As I broke open the pomegranate and brilliant red seeds tumbled into the waiting bowl, I glanced up at that quotation by Thoreau tacked on the cupboard in the kitchen. I smiled because I had to think this is exactly what Thoreau had in mind. With red stained fingertips I picked the seeds gently out of the pomegranate pieces, every so often stealing a few to savor the sweetness while I worked. I look forward to pomegranate season all year long. When it finally arrives in the autumn, I just can’t wait to break open the first one. My first memory of eating a pomegranate was in elementary school sitting out on the dining terrace in the hot Florida sun. There was a sweet girl in the class one year behind me who dreamed of one day becoming a doctor, a heart surgeon to be precise. I remember admiring her drive and passion way back then, and I’ve never doubted that she achieved her goals. We weren’t in the same class and only rarely met, but I liked watching her pour over encyclopedias in the library and knew we had a lot in common. She had long straight black hair, a shy smile and brought the most intriguing things in her lunch sack. That’s where, one day, she pulled out a pomegranate. It was the first time I had ever seen one, and I was so grateful she let me try some. In retrospect, I imagine she was grateful to have found a kid who didn’t make fun of her for having a pomegranate instead of peanut butter crackers or a fruit roll-up! 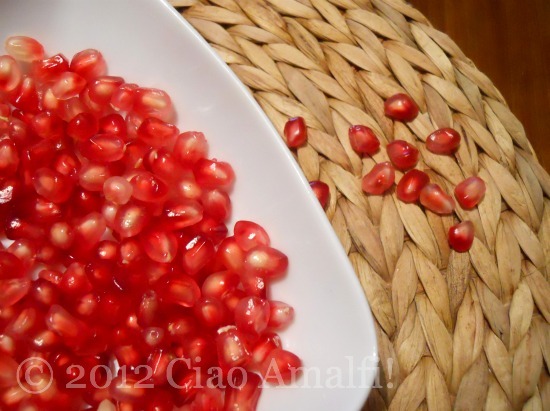 That was the first time I ate a pomegranate, and I often think back to when I was a kid as I work the seeds out of pomegranates now. I suppose that’s because I never ate them again until moving to Italy. One early autumn day on the bus from Amalfi to Sorrento I swore I saw a pomegranate on a tree as the bus whirled around a corner near Positano. I came home and looked up the word immediately in the Italian dictionary. Melograno is the Italian word for the tree and melagrana is the word for the fruit. I kept my eyes out for them when I visited the fruit shop, and soon enough I spotted piles of pomegranates arriving for the autumn. 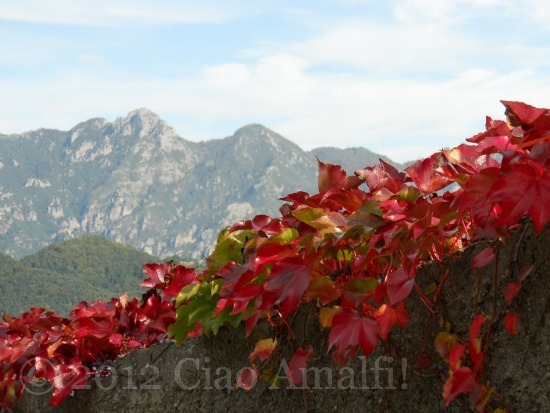 Now they’re one of the fruits I look forward to each year with the arrival of autumn on the Amalfi Coast. Whatever influences pomegranates may have on me, I’m happy to resign myself to them. Like clockwork, the end of October often brings with it a big storm and an abrupt change in the seasons. One day the beaches will be dotted with sunbathers enjoying the last warm autumn days while holding onto summer for as long as possible and then the next the beaches will be barren and covered with debris washed up from the rough seas. We’ve had a few intense storms pass over the Amalfi Coast recently, and they brought with them the official end of the summer season. During a break in the rainy weather last week, I was out and about and was struck by the sudden change. Where not long ago there were rows upon rows of beach chairs lining the rocky Lido delle Sirene in Amalfi, now the beach is empty for the winter. The colors were brilliant, even more so after the recent storms. The rough sea had churned up a spectacular turquoise that only shows up after bad weather. Besides the Amalfitans coming and going, the walk along the harbor was quieter than usual. After seeing the empty beaches, the other indication that the season has ended is the empty port. The boats have been loaded up and driven away on big, traffic blocking trucks to safer spots for the winter. Even the docks that are lined with boats all summer long are pulled up to protect them from rough winter seas. They’ll become scenic perches for the seagulls for the rest of the winter. Perhaps the strangest sight at the beginning of winter is seeing the Marina Grande beach, the largest in Amalfi, completely empty. If you’ve been swimming here during the summer months you’ll know just how odd it is to see it without the rows of beach chairs and candy colored umbrellas. It will look like this, besides the odd group of visitors having a picnic on a sunny day and those rare locals that swim all year round, until next spring. 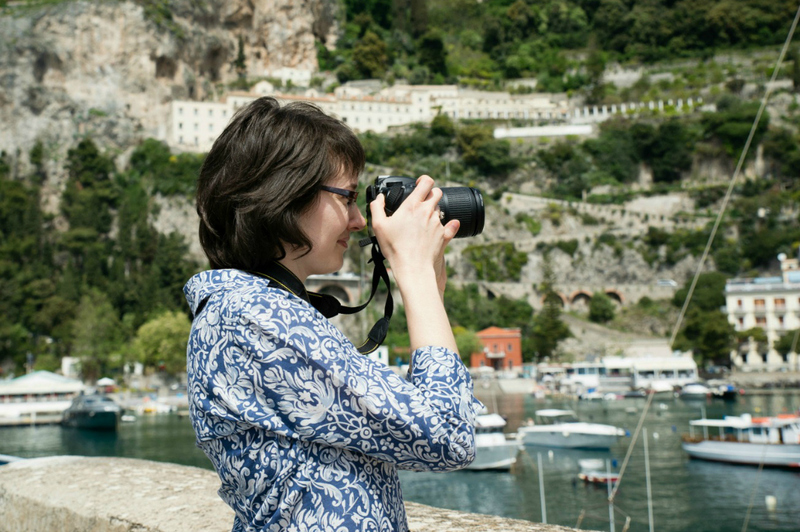 The season has ended, but with it another has begun in Amalfi. While it’s different for everyone, for us this is the time for catching up after a busy season – for running all those errands that there simply hasn’t been time to do and for trying to find some much needed moments of relaxation at the same time. The Christmas holidays are around the corner, but for now I think I can use just a little bit of time overlooking an empty beach.